Rihanna returns to the UK, Harry Styles makes a new furry friend and The Wanted film their new music video in our round-up of this week's best pictures. The boy band released the cover artwork to their hugely anticipated new album 'Take Me Home' this week. 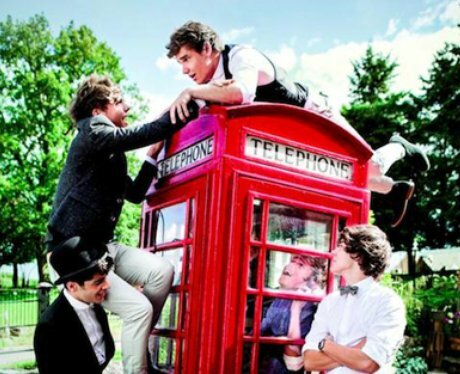 The image features the boys joking around on top and inside a traditional red telephone box. The 'We Found Love' star wore a pair of extravagant snakeskin boots as she headed back from a night out in the capital. The 'We Found Love' star arrived at Heathrow Airport this week ready to start meetings with UK high street chain River Island about designing her first clothing range. Picture: Flynet. The Canadian star performed her hit single 'Call Me Maybe' at the annual tennis event at the USTA Billie Jean King National Tennis Center in Queens, New York. In the week that they scored their first number one on the Vodafone Big Top 40 with 'Wings', Little Mix appeared in the new issue of FIASCO magazine in a unique photo shoot that sees the four girls styled like sixties pop stars. Images courtesy of FIASCO Magazine, photography by Elliott Morgan. In shops now. The 'Party & BS (How We Do)' star wore a two-piece PVC outfit, complete with fire patterns, while launching her new album 'ORA' with a fan signing event in London. The 'R.I.P.' singer has been travelling across the UK this week helping to promote her album, which features contributions from Tinie Tempah, Will.i.am and DJ Fresh. After landing back in America this week Cher got to perform live on huge NBC series The Today Show, where she wowed in a multi-coloured tutu-style dress, ahead of her debut album's release there this October. The 21 year-old singer-songwriter performed at Sound Control in Manchester this week fresh from the success of her recent single 'Party & BS (How We Do)' and newly released album 'ORA'.